We’re back! With another video, you lucky dogs you. Remember when we made that pad Thai? And those mimosas? 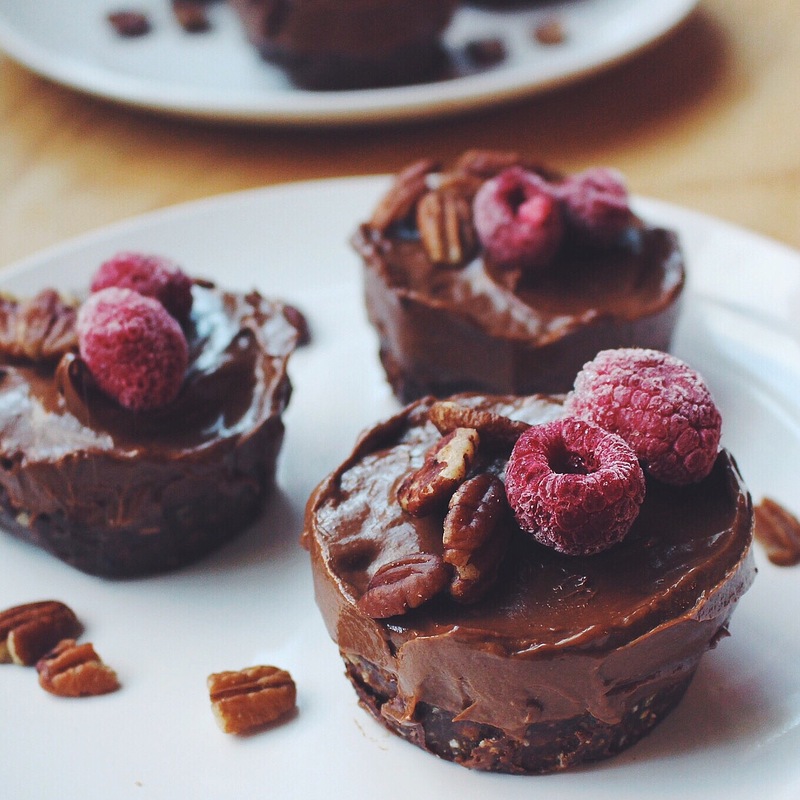 Well we made raw chocolate avocado mousse tarts afterwards, and filmed that too. These are the perfect “something sweet” to enjoy after an afternoon of food and fun with your best gal (or guy, or non-binary) pals. 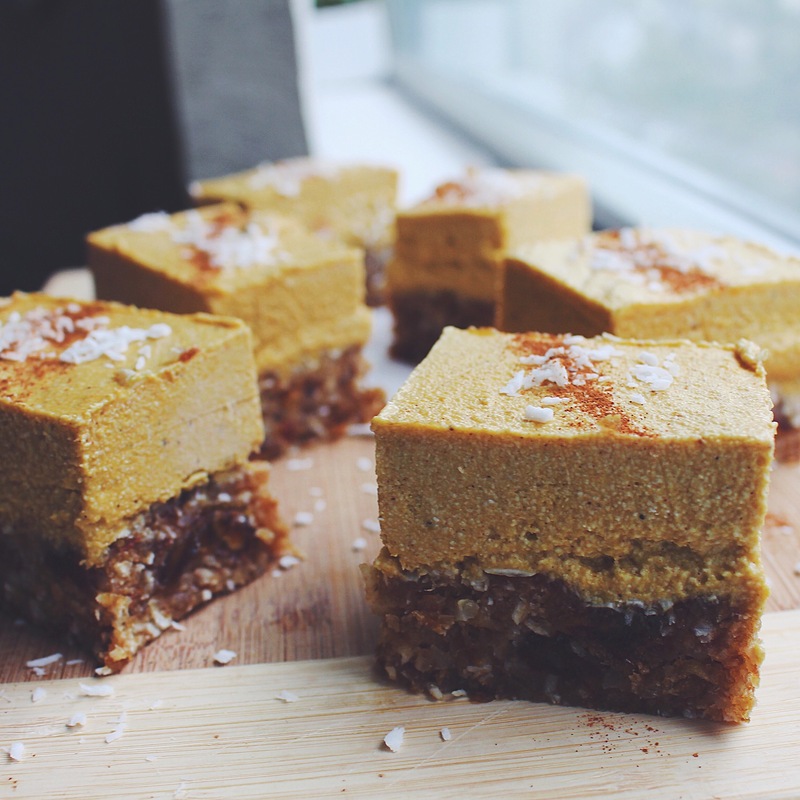 These tarts are raw, gluten-free, vegan, soy-free and artificial sugar-free. They’re SO easy to make too! All you need is some handy ingredients, a blender, a muffin tray and a freezer. Being fuelled by mimosas is also beneficial, but not a requirement. Watch the video, then follow our recipe! Enjoy. Line a muffin/cupcake tray with plastic wrap or strips of wax paper, as shown in the video. Blend the dates, raw almonds, shredded coconut, raw cacao powder, and pink Himalayan salt until mixture is fine in texture and thoroughly combined. Press the tart mixture into the base of each muffin base. 1/4 inch of the way full is ideal. Set aside tray with tart bases in freezer for time being. Blend all ingredients for the mousse together until smooth and creamy in consistency. Spoon the filling overtop of each tart base until each muffin cup is full. Pat down mousse with back of spoon for a flat look. Allow the tarts to freeze for 1-2 hours before serving. Serve chilled. Makes approximately 8-10 servings. I made these back in February for Valentine’s Day (*bursts into tears because of how long it’s taking to catch up on posts*) but these treats are appropriate for any ol’ time of the year! Pair a few of these with a bottle of champagne for a romantic evening with that special someone, or whip up a batch strictly for yourself to enjoy because you deserve nice things. SELF LOVE, PEOPLE. In a high speed blender or food processor combine all base ingredients (dates, almonds, cacao powder and pink salt) until thoroughly incorporated. Mixture should be similar to a loose “dough”. Transfer “dough” onto baking sheet lined with parchment paper. Use rolling pin or simply press down with fork to create an even layer about 1cm thick. Press heart-shaped cookie cutter (or whatever) into dough, remove surrounding dough, then place cookie onto second piece of parchment paper. Roll dough out into an even layer again, then repeat this step over and over until all the dough is used. Set in fridge at least 1 hour. Combine icing ingredients (cashews, lemon juice, maple syrup, coconut oil and vanilla extract) in blender until creamy and smooth in consistency. Remove cookies from freezer and spread icing onto each cookie. Leave a bit of a border around the edges. Place back in freezer so the icing sets a bit. Remove in advance before eating, then serve with additional lemon slices and strawberries as garnish. Let thaw before serving. Keep in refrigerator or fridge. This were so good. Like, TOO good. Is there such thing? Well if there is, these are exactly that! I made these little food dudes a while back. I prefer making bite-size versions of desserts because I honestly tend to just make a huge mess whenever I attempt to slice into a large cake or whatever, but you could totally modify this easily by using a pie pan instead! Line a muffin tray with plastic wrap or long, thin strips of wax paper (the latter is easier). Use a high-speed blender or food processor to combine almonds with 1 cup pitted dates. Press mixture firmly into each muffin cup to form base/crust. Pat down with fork if needed. Set aside in freezer for at least 30 minutes. While crusts are setting, prep the apple pie filling! Combine remaining dates with water, cinnamon, nutmeg and sea salt in blender into a sauce that’s gooey and semi-liquid in consistency (think caramel). Peel the apples and cut into small, bite-size chunks. Mix everything together in bowl (or if your blender has a removable blade, combine in there and save yourself from doing extra dishes) until the apple chunks are thoroughly coated in the sauce. Remove muffin tray from freezer. Pop crusts out of each cup and place on large cutting board or plate. Spoon filling into each cup so that it’s full well over the top of the crust, but the sauce isn’t overflowing over the side. Place back to freezer at least 1 hour to set. When ready to eat, partially thaw and serve immediately. Enjoy cold! You could even top with a dollop of coconut whipped cream. Makes approximately 9 individual treats. 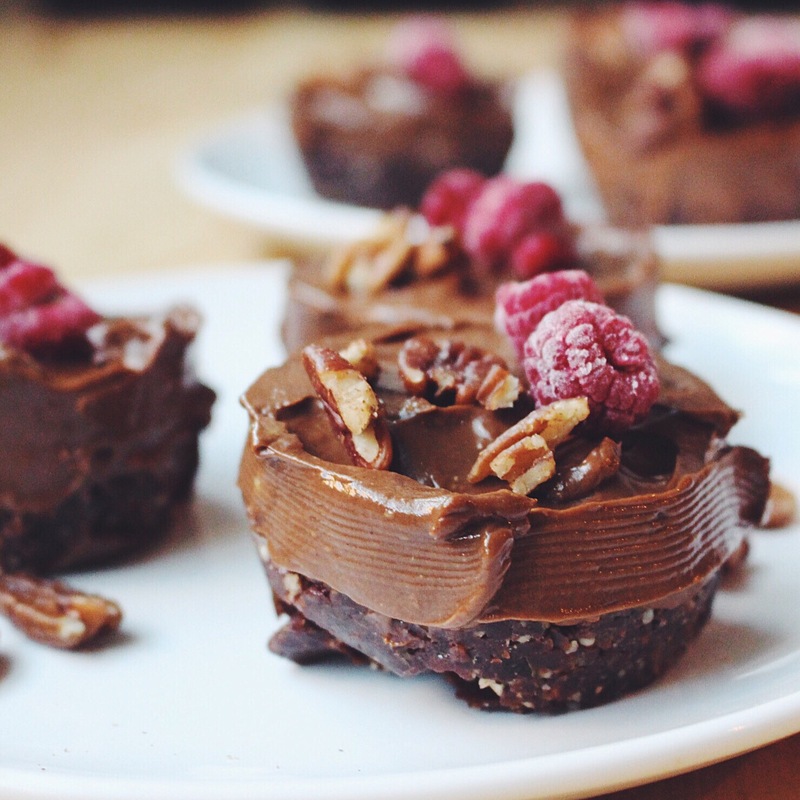 Okay, can we just take a moment and appreciate the fact that the majority of the recipes we post on here are healthy versions of normally *very* unhealthy desserts? Take this banana split, for example. 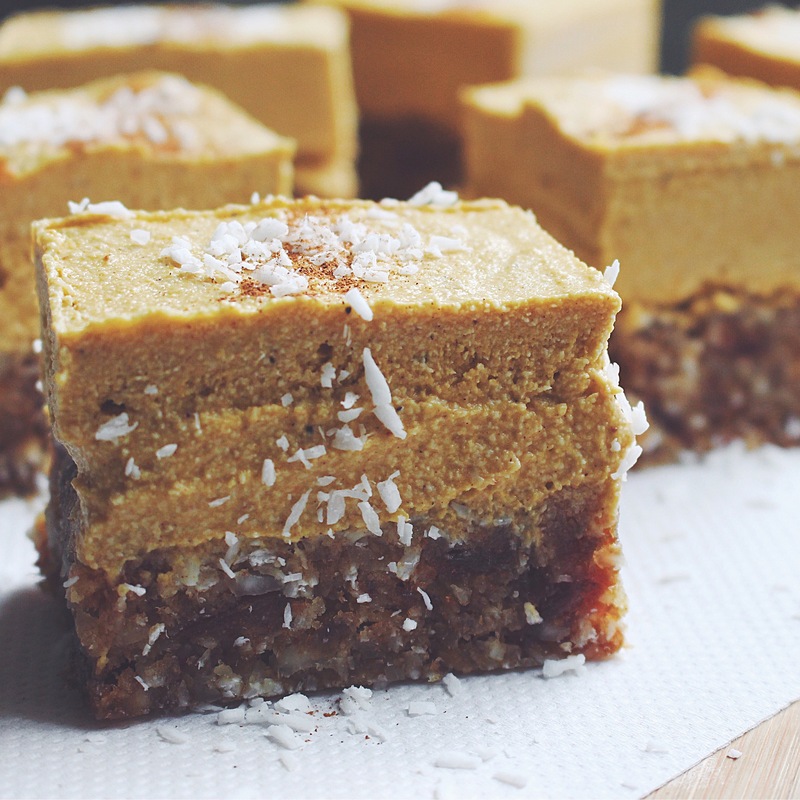 It’s 100% raw, no-bake, gluten-free, vegan and refined sugar-free. It truly is a wonderful time to be alive. In a high-speed blender or food processor combine the frozen banana and raspberries together until a smooth, creamy consistency similar to soft serve ice cream has been reached. Scoop into a large bowl and set aside in freezer for now. To make the raw chocolate sauce: Combine raw cacao powder, coconut oil, maple syrup and 1 tbsp of the vanilla extract until pourable. Set aside. To make the coconut whip: Open can of coconut milk and carefully separately the solidified coconut milk at the top from the coconut water at the bottom. Scoop the solidified coconut milk into bowl. Use electric beater to whip coconut cream with 1 tbsp vanilla extract and a touch more maple syrup if desired. Whip until soft peaks have formed. Remove “ice cream” from freezer. Slice banana in half, and place one on half on each end of dish. Top with a drizzle of chocolate sauce and a dollop of coconut whip, then sprinkle raw walnut crumbs over whole dish. Finally, throw a cherry on top just for the hell of it. Makes 1-2 servings. Serve cold. It’s about time that we posted sometime pumpkin-related! 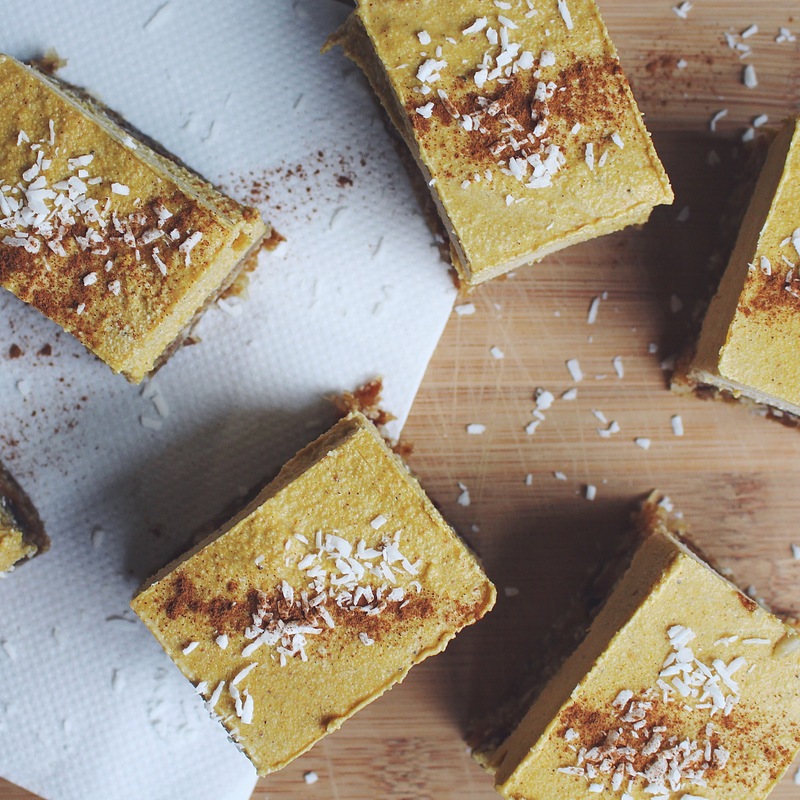 Ditch your Starbucks PSL (wow, what a pity) and make these sweet treats instead. Blend macadamia nuts, dates, coconut and flax until thoroughly ground and incorporated. Press mixture into the base of an eight-inch square cake pan lined with wide strips of parchment paper. Ensure that base is flat to form an even crust. Blend cheesecake filling ingredients until smooth and creamy in consistency. Add more agave if necessary to further smooth. Pour cheesecake filling onto base and allow blondies to freeze for 1-2 hours or overnight if possible. If freezing overnight, allow blondies to thaw at room temperature for about 20-30 minutes before slicing. Garnish with toppings of choice. Pictured is a dash of cinnamon and shredded unsweetened coconut. Enjoy! Makes approximately 12 blondies.